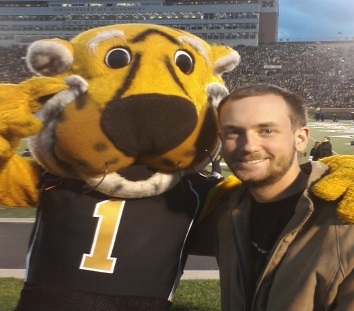 Josh McSwain (@mcswain_j) is a Missouri alum and fan for better or worse. He loves all sports and enjoys writing about them (Truman’s Tales) in between his market research career. If I had to describe his current confidence level for his beloved Missouri Tigers, I would describe it as “not very high.” The good thing is, like his beloved Missouri Tigers, he doesn’t get very defensive over my questions. 1. What is the first thing that Missouri fans think of when Auburn football comes to mind? I think for most Mizzou fans it’s the 2013 SEC Championship game when Mizzou still had hope of playing for a National Championship. I remember going into that game thinking my Tigers had a chance but Tre Mason smashed them. Even so, I was pulling for Auburn to upset Florida State in the National Championship Game. After going 3-9 the previous year I was hoping for them to win it all. If Mizzou had won that SECCG and gotten to the NCG, I think we would have lost to FSU (maybe even big, that team was arguably the most talented team of the past ten years). But beyond that game, I think most Mizzou fans either think of Cam Newton or Bo Jackson; depending on how old they are. 2. What’s the mood like for the rest of the 2017 season? The sky is falling. Getting beat down like they did at home by Purdue has shattered most hopes of even making a bowl. It’s a bit unfair because Purdue is not a bad team; under Jeff Brohm they have come together very quickly. But through three games watching this team the defense just looks out of sync, undisciplined and as if the talent has fallen off. There will be more people fired after the season. 3. Name two Missouri Tigers that Auburn fans should worry about and why. I would say Johnathon Johnson on offense and Rashad Brandon on defense. Johnson is a small guy but an absolute blur on the field. Mizzou needs to get him the ball in space and let him work. With Brandon, while the defensive line as a whole has been disappointing, Brandon has been one guy that has shown effort consistently. He’s got good feet and speed for a big guy. 4. Name two Auburn Tigers that worry you and why. Kamryn Pettway because he will pound this feeble run defense and Tre Williams on defense because he is a tackling machine. Chris Davis simply because of the kick six which beat Alabama (I have no hatred of Alabama specifically I just root for someone different to win) and maybe Cam Newton. I just love his enthusiasm for the game (even though some folks see it as showboating) because he reminds us that it’s a game and it should be fun; which is not okay in the stuffy old NFL. 7. What’s the best and worst case for Missouri this Saturday? Best case scenario is that the coaches bust the team’s chops after their humiliating loss to Purdue and the team gets the message and comes out mad and actually looks competitive. The worst case scenario is that the team just throws in the towel, the coaching staff continues to make no adjustments and they come out flat and potentially get beaten worse than last week. Auburn should win this game easily. I could see them getting 500+ rushing yards just like they did in the last meeting. I just wonder how many fans show up to the game after the second half last week was borderline empty. Auburn wins 45-13. 9. Where will Auburn and Missouri end up this season? Auburn could actually challenge Alabama for the SEC West title. Jared Stidham might be the QB that Auburn needs to pull the upset at home. Their offense struggled against Clemson but the defense is still pretty good and the offense should continue to get it together. If Mizzou wins three games, I think that’d be about the expectation now. 10. Please don’t get defensive about this question… wait, there’s no defense in Columbia… anyway, should Missouri be in the SEC. What is a true SEC school? Do they have to compete in athletics? I think the Tigers have shown they can compete in athletics. Volleyball went undefeated in 2013, football won the division twice in their first three seasons, basketball should be competitive this year, and track and field has had some success. However, the most successful sport at Mizzou is wrestling. I would have been happy going to the Big Ten, but alas they did not want us. I think we would have been a better choice for that conference than Maryland or Rutgers. However, I am happy in the SEC because of the stability and general sense of cooperation among the members. Josh came across as a general good fellow, so I will say that I like Mizzou’s helmet stickers. And their mascot is better than Clemson’s crackhead tiger. But still… the 1950’s pajamas/Halloween costume needs an upgrade.